The Department of Transport, Tourism & Sport have recently issued Marine Notice #28 of 2015 advising of forthcoming survey operations off the east coast of Ireland. 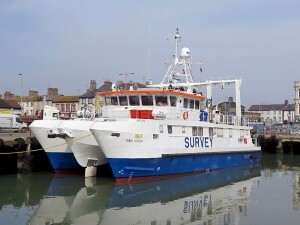 Commencing on 22nd June 2015 for a period not exceeding 60 days, two survey vessels (MV Bibby Athena & MV Proteus) will survey the route of the East West Interconnector between Rush, Co Dublin and Prestatyn, North Wales. Survey operations will involve towing survey equipment on and below the water surface, up to 300m behind the vessels. All vessels, particularly those engaged in fishing are requested to give the survey vessels a wide berth and keep a sharp lookout in the relevant areas at all times. The full text of the Marine Notice, along with survey route details is available from the Department’s website. This entry was posted in Marine Notice, water safety by Skerries Coast Guard. Bookmark the permalink.